A few people were interested in getting a pattern for my scrappy cat pillow top. 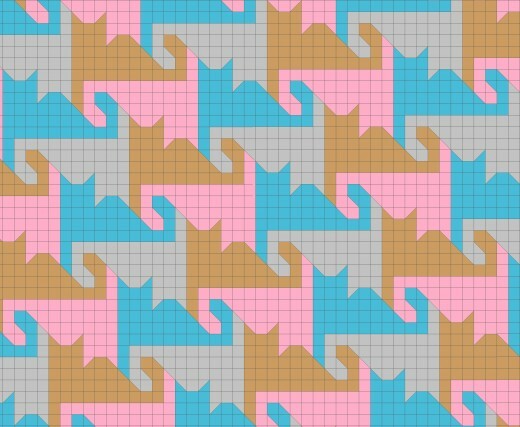 If you search for tessellating cat quilt patterns, you'll see all sorts of versions. Here's a graph and link to this page which is similar to mine. I saw one a lady made and she said she got it from the Oct. 2009 McCalls magazine. I'm getting motivated to try this again. Here are some unfinished dimensions in inches for the cat sections for mine. You can cut out and assemble intuitively, using a few instructions I included below. Ooops. I already see a mistake-- the body piece should say 9 1/2 x 4 1/2". 5 x 2" background and apply the 2" squares to each corner, sew on the diagonal line and then trim off leaving 1/4" seam. Body 4 1/2" x 9 1/2"
7 1/2 x 2" plus two 1" squares marked with diagonal line and sewn to create the curved end. See diagram and cut out each piece. a. To the 2 1/2" squares apply a 1 1/2" square with drawn diagonal line to one corner and sew along the diagonal and trim leaving 1/4" seam. Press back. b. To the 4 1/2 x 1 1/2" (yellow section on diagram). Sew 1 1/2" squares with drawn diagonal lines to each end, sew along the diagonal line, trim, and press. Sew curved tail sections (including the haunch) together. Probably needs some testing so good luck! Thanks so much, Sherri for giving us the measurements! I'm off to search through my scraps to see what I can come up with. Cute pillow and tessellating patterns are always so neat!